MIDDLEBURY, Vt. — At Middlebury College’s opening Convocation, President Ronald D. Liebowitz encouraged the Class of 2016 to delve “both deeply and broadly” into the academic curriculum during their undergraduate years. Ronald D. Liebowitz, the 16th president of Middlebury College, giving the Convocation address. His third recommendation was to “strike a balance in what you study and what you do outside your academic work and what you do to create a satisfying social life. Contrary to how it might seem from afar, the transition to college is never seamless for anybody. Flanked by the Class of 2016, the faculty march into Mead Chapel. 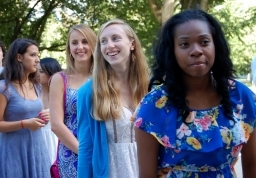 After five days of Orientation, the members of the Class of 2016 lined up along Storrs Walk for the start of Convocation, just as generations of other new Middlebury students have done throughout the years. They applauded as the faculty marched into Mead Chapel led by associate professors Juana Gamero De Coca and Larry Hamberlin, who served as this year’s faculty marshals. As the college organist, Professor Emeritus of Music Emory Fanning, played the processional, the new students filed into the chapel according to Commons: Atwater, Brainerd, Cook, Ross, and Wonnacott Commons, each one named after a major figure in the college’s history and each with its own special traditions. The Rev. Laurel Macaulay Jordan, a 1979 graduate of Middlebury and the college chaplain, gave the invocation, and President Liebowitz took a moment to ask the members of the first-year class to pass around Gamaliel Painter’s cane, an enduring symbol both of the college and of institution’s humble beginnings. “The Internet offers access to resources that were unimaginable a generation ago transforming how we learn," Spears said. "But with these possibilities come challenges, not only in how we evaluate online sources and sift through information, but also in the amount of time we spend engaging the world through virtual means. 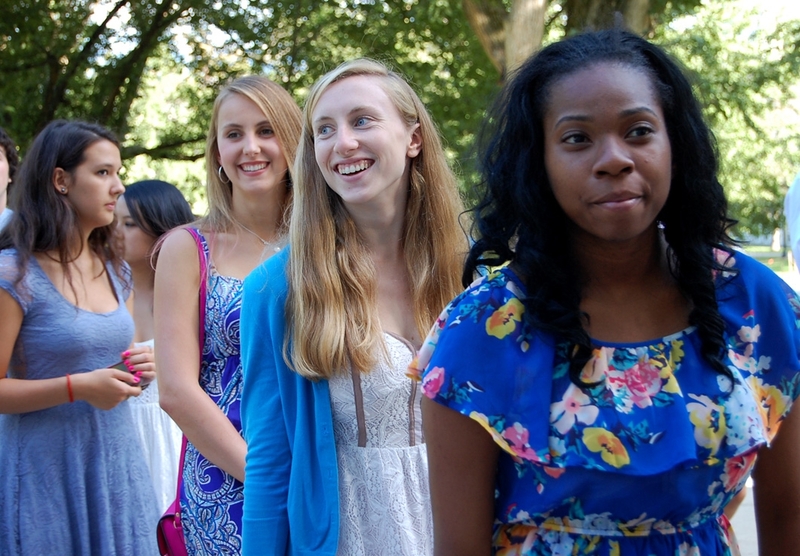 First-year students filled Mead Chapel on Sunday. After the vice president’s welcome, each of the Commons heads introduced the members of their Commons en masse to President Liebowitz and spoke briefly about what distinguishes their grouping. The members of the senior class who were elected last spring to Phi Beta Kappa were introduced, and Twilight Artist in Residence François Clemmons sang “Sure on this Shining Night” by Samuel Barber, with Professor Fanning’s accompaniment on the piano. 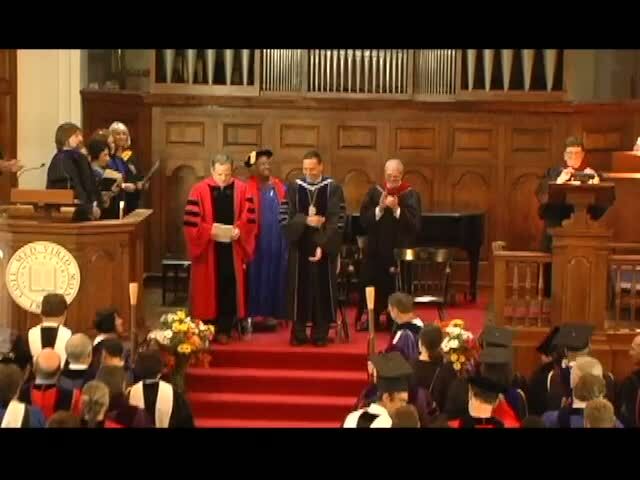 The president delivered his Convocation address and Rabbi Ira Schiffer, associate chaplain, delivered the benediction. The gathering then sang the Middlebury alma mater and recessed out of Mead Chapel, their formal introduction to the Middlebury College community now complete, save for the official class photograph which was taken on the lawn adjacent to nearby Hepburn Hall.